Before I come to the Tudors and Stuarts Weekend, I thought I would mention the ‘Family and Power in the Middle Ages’ conference that will be taking place on Friday and Saturday this week. Next week is the ‘Gender, Places, Spaces, and Thresholds’ conference that Dr Diane Heath is running for the Centre at Canterbury Christ Church – for details see: http://www.canterbury.ac.uk/arts-and-humanities/research-kent-history-and-archaeology/crkha-latest-projects/place-space-and-liminalities.aspx but I thought I would also draw your attention to the Eleventh Annual Thomas Becket Lecture. Details of Dr Paul Webster’s lecture are now available at: http://www.canterbury.ac.uk/arts-and-humanities/events/arts-and-humanities/ckhh/eleventh-annual-thomas-becket-lecture.aspx and it promises to be a very special occasion because Paul is a well-known expert in the early cult of Becket studies. Jeanette Earl mentioned that she had seen a report in the Independent on Thursday, in which the 60 plus writers of the Historical Writers Association had conducted a poll recently at the Harrogate History Festival concerning the ‘best’ and ‘worst’ English monarchs. According to the writers, the worst was Henry VIII who was condemned as “self-indulgent” and a king who “ruled with little more policy than petulant self-gratification”, while his daughter Elizabeth I was voted the best. Interesting choices and yet again I might argue they show just how good the Tudors remain at capturing the public imagination, whether it is a brooding Thomas Cromwell at Wolf Hall or Elizabeth dancing with Robert Dudley – if you don’t know the latter, a contemporary painting at Penshurst Place will enlighten you. Of the others who were at the wrong end of the poll, Charles I is probably not that much of a surprise, and King John similarly came out poorly in the popularity stakes. John’s inclusion is to be expected considering the focus on Magna Carta this year, and on the subject of anniversaries, I might have expected Henry V to have been somewhere near the top of the ‘best’ considering the next big anniversary this year in that of the Battle of Agincourt. Yet, just as there are some noteworthy Tudor monarchs, their medieval predecessors are actually equally interesting although some may be less well known more generally. However for those who come to the Medieval Canterbury Weekend next April 1 – 3, you will get a chance to hear Dan Jones, Helen Castor, David Carpenter and Louise Wilkinson talking about many of the fascinating members of the medieval royals, including those from among the Plantagenets, a highly colourful group of kings, queens and princesses if ever there was. Another royal who will feature, one who spent quite a time as the king-in-waiting but then never actually made it, his son following Edward III instead, is the Black Prince. These royals were complex characters and the Black Prince definitely fits that description, as Michael Jones will discuss on Saturday 2 April. 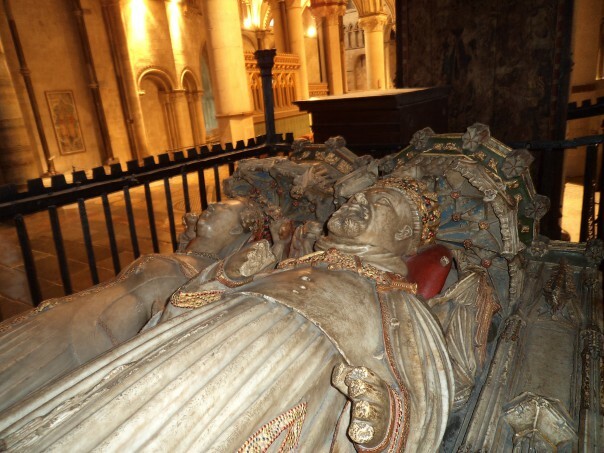 As Prince Edward (the Black Prince name came later) he resides in a fine tomb in Canterbury Cathedral, even though not where he intended, and across the way on the other side of the site of Becket’s shrine is the tomb of Henry IV – who took the throne from the Black Prince’s son Richard II and who definitely did want to be that close to the martyred archbishop’s shrine. Returning to the poll, it is interesting that Richard III was not mentioned in the report but perhaps Leicester’s activities on his behalf have countered Shakespeare’s image somewhat. Yet if we discount his brother Edward IV, the Lancastrian kings either side: Henry VI and Henry VII may not have been as physically big as Henry VIII but are remarkable and even, perhaps, more controversial. ‘Poor’ Henry VI has in the past been seen as a loser who totally failed to live up to his father’s gigantic reputation as a military commander, and who was more saintly mouse than anything else. However for those who come to hear David Grummitt you will get a more nuanced understanding of his reign and contemporary ideas about kingship. While for those to come to David Starkey’s talk on Henry VII, you will gain insights into an exceedingly interesting personality and a king who can be viewed as sitting uneasily on the cusp of a ‘new’ monarchy.